Robin Hood is one of the most famous legends in English tradition. The talented archer and his band of merry men are well known for living as outlaws in Sherwood Forest and for their daring exploits against the Sheriff of Nottingham. The earliest recorded mention of Robin Hood is in the fourteenth century poem, Piers Plowman. He is then also the focus of early fifteenth and sixteenth century ballads such as A Gest of Robyn Hode, Robin Hood and the Monk and Robin Hood and the Potter.The historian W. E. Simeone suggests that the myth reached its peak during the sixteenth century, where its fame was fuelled by Robin Hood’s significance in May Games, which Simeone likens to becoming almost ‘a saints day’ for the outlaw. May celebrations would include re-enactments of Hood’s deeds, as well as ballads or plays based on his life. According to Simeone, the May Games assured the ‘immortality of his legend’. The tale of Robin Hood has also generated intense debate about whether Hood was a genuine historical figure or if the stories are just a myth. The Scottish Chroniclers, John Fordun and John Major, first speculated that Hood was real, followed by two sixteenth-century historians, Richard Grafton and John Stowe. In 1795, Joseph Ritson published a collection of Robin Hood ballads titled Robin Hood: A collection of all the Ancient Poems Songs and Ballads now extant, relative to that celebrated Outlaw. Ritson believed Hood was a true historical figure and included an account of Robin Hood's life based on various sources in the preface of the book in order to back up his claims. It is very difficult to trace Robin Hood through history due to the common nature of his name – ‘Robert’ (or ‘Robin’) was a very common name medieval England, and ‘Hood’ a common surname given to those who either made hoods or often wore a hood. However, more modern approaches to the legend have eroded the view of Robin Hood as a real historical figure. The absence of the outlaw in contemporary chroniclers and the work of historians such as Francis Child seem to strongly suggest Robin Hood is nothing more than a popular English folk story. “A modern day Robin Hood”. This is the term British newspaper, the Daily Express, used to describe Steven Shaw, a former employee of Swindon Borough Council, in their article on the 21st of June 2015. The article (written by Natalie Chalk) describes Shaw’s use of “his position of power as a housing benefit officer to make large overpayments to people he thought were struggling to get by”. Mr. Shaw made payments of nearly £56,000 to friends whom he believed needed a financial boost, all whilst making no personal monetary gain. The comparison between Mr. Shaw and the mythical Robin Hood is obvious; stealing from the government and giving to those in need. By comparing Mr. Shaw to Robin Hood, it would appear that this article wishes to positively portray his actions as Robin Hood is one of the most beloved British mythological figures in modern day Britain. By drawing comparisons between Robin Hood and Steven Shaw, the article in the Express implies that Shaw was fighting for justice for those who could not and was doing so against a tyrannical regime. The idea of the struggle of the weak and poor against the strong and rich is an idea as popular among the general public (those who see themselves as victims of the regime, perhaps) now as it was in the time of Robin Hood. Equally, the punishment of these “symbols of justice” is as prevalent today as it was in the time of King John. Mr. Shaw was sentenced to 18 months in prison for unlawful distribution of public money: Shaw’s imprisonment echoes Hood’s outlaw status. This cements Robin Hood and his followers’ place in modern culture as “the most-sympathised with outlaws in history” as his name is invoked here to draw sympathy from the public. Across the country, Robin Hood’s name and image are used in a variety of different ways. Robin Hood airport is located in Doncaster, South Yorkshire, the Robin Hood Gardens housing estate existed in London until 2013 and, in 2011, the Daily Mail, another British newspaper, published a list of the most popular pub names in England, revealing eighty establishments across the country named The Robin Hood (a further nine being called the Robin Hood and Little John). Within Nottingham, Robin Hood’s famous stomping ground, the outlaw’s name is used even more freely; everything from government funded energy providers to railways lines to travel savings cards all bear the name Robin Hood. The use of his name in modern-day England gives some indication of the popularity and love the British people feel for this mythological hero. As Brendan O’Neill puts it in his 2009 article for BBC News, “Robin… and his Merry Men… have become symbols of justice against greed and tyranny”. Robin Hood is as popular in British culture today as he ever has been. He serves as a symbol of justice against tyrannical regimes, an almost universal message among most of the population, and, despite being seen as a criminal at the time, the selfless ideology that drove his crimes is still replicated today, complete with the sense of sympathy and compassion to those who have tried to follow in his footsteps and lend a helping hand to those who they thought needed it. And yet, a recent essay in the London Review of Books has pointed to ways in which David Cameron’s Conservative government have reinterpreted the ideas of Robin Hood to position it as Robin Hood, protecting the vulnerable tax payer from the depredations of the welfare state. A demonstration, if one were needed, both of the force of myth, and its capacity for reinterpretation. Robin Hood is one of the most well-known English characters today and evokes imagery of heroism, chivalry, charity and politically rebellion. The infamous notion of stealing from the rich to give to the poor has been portrayed by Shakespeare, Keats, Tennyson, Mel Brooks, Douglas Fairbanks, Errol Flynn, Richard Greene, Sean Connery, Russell Crowe and a Disney cartoon fox. The memory of a shadowy figure who, alongside a fraternity of rebels and outcasts, sought t o upset the balance of power by shifting the status quo in favour of the have-nots of society is always going to relevant in societies and cultures focused around materialism and capital gain. Nowadays the Robin Hood myth is centred on the city of Nottingham where statues, plaques, themed walks and annual festivals can be found, all contributing to a sizeable tourist industry. Robin Hood still captures the hearts and minds of people today and holds contemporary importance. For example, Sherwood Forest or Robin’s Forest is still capturing attention. In 2008 there was a renewed campaign to restore the forest, which is estimated to have been 100,000 acres in medieval times but currently stands at 450 acres. The project hoped to be granted £100 million in lottery funding. The fact that the area surrounding the myth commands such level respect from a significant proportion of society is indicative of the power myths can have on a perception of history. We can see the influence of adding fantastical elements to history and capturing the imagination of a society. Robin Hood is described by British historian Eric Hobsbawn as a “primitive rebel”. His myth has underlying political ideology which reveals the development of modern ideology through the primitive forms of social rebellions. Ideas regarding human rights ranging from democracy, independence to justice were represented by the protagonist. Moreover, peasant’s revolts that happened during the late medieval period “also prepared the ground for the popularity of Robin Hood saga”. The context of the myth of Robin Hood can be linked to peasant rebellions. However, the myth should be seen as a propaganda advocating the use of social revolts in searching for solutions in the latter period. Robin Hood is an anachronistic public hero in enhancing modern political ideology as he encourages peasants to resist the authority. His characterization as a criminal or outlaw who support peasants against the antagonistic authorities encourages anti-clerical and anti-governmental ideas. Robin Hood as an outlaw had sympathy for the people who are oppressed in the society. For instance, those whose lands were stolen by lords or the people who had no saying in the society. Also, Robin Hood is a symbol for justice. He defies the law and social order to curb the rich and assist the poor. Such acts glorified him as a peasant hero, hence was a justification of using violence in the means of securing justice. The counter-law of Robin Hood was greatly inspired by the rebels during the late medieval period. Assumptions can be made about the Peasant revolt of 1381 being correlated to the unpopular law as a great inspiration to the creation of Robin Hood. Wat Tyler’s rebellion in 1381 was the first major uprising against the church and the ruling class. Although the rebellion reflected only the frustrations of the poor. It was also “something closer to a real mobilization of people who had won some victories for themselves and their fellow villagers… who thought of themselves as humans with rights”.There are insufficient evidence to show that Robin Hood advocated the need of rebellions directly, but it was a myth which glorified social unrests during the late medieval period. Apart from the many rebellions during the period, the forest law was on the height of enforcement during the twelfth and thirteenth century. It has forbidden hunting and wood/timber collection in royal forests, which was an important source of income of many peasants. The despair of the peasants would have increased their anti-clerical and anti-governmental sentiment, hence the widespread of the tale of Robin hood at the same time period. Therefore, peasants were more likely to aspire the restoration of justice within the thirteenth and fourteenth century. Buhle, Paul, Chris Hutchinson, Gary Dumm, and Sharon Rudahl. Robin Hood: People's Outlaw and Forest Hero: A Graphic Guide. Oakland, CA: PM Press, 2011. Dalton, Paul, and John C. Appleby. Outlaws in Medieval and Early Modern England: Crime, Government and Society, C.1066-c.1600. Farnham, England: Ashgate, 2009. Knight, Stephen. Robin Hood: An Anthology of Scholarship and Criticism. Woodbridge, Suffolk: D.S. Brewer, 1999. Robin Hood is the epitome of a great mythical figure. He inspires people, embodies heroic qualities and is still talked about to this day, all while historians still debate as to whether he was real or not. The easy thing to assume is that, if he were just a legend, Robin Hood is not a valid historical source, but, ultimately, does this matter? Real or not, Robin Hood is an icon, as much today as he would have been in his own time. People at the time made the Robin Hood character a hero, so what does this say about those people? Even if Robin Hood was just a character, he is still a useful tool in assessing the attitudes of the general public during the period of his creation. His qualities and actions were admired by the people at the time and from this, we can tell a lot about their everyday struggles and the actions they wished they themselves could take to rid themselves of said struggles. Robin Hood’s embodiment of anti-establishment attitudes may have no only reflected the common people, but also inspired them; for example, the Peasant’s Revolt. Despite his existence being question, Robin Hood as a historical character cannot be overlooked; anything that is popular is popular for a reason and, in the case of the legend of Robin Hood, his popularity stemmed from the feelings of the general public. Historians can use Robin Hood and any other mythical hero to analyse the emotional state of the common people at the time, because, if these figures did not appeal to the common people and embody their secret desires, they would not have become lasting heroes. British Heritage. May2008, Vol. 29 Issue 2, 8. Irish mythology resides well in the minds of the Irish culture. Although there are believers and non-believers, the respect shown to Ireland’s mythical history is valued with the help of men such as Eddie Lenihan. Eddie is the typical Irish folklore enthusiast/storyteller but when an upgraded motorway route from Limerick to Galloway threated to destroy something dear to Eddie, he turned from storyteller, to activist. Eddie was endeavoring to protect a mythical fairy tree that was a meeting point for the faeries of Kerry (southern region of Ireland) when they go into battle with the faeries of Connaught (western region of Ireland). Amazingly, Eddie prevailed with his objection and saw the Clare County Council draw up a contract stating not only that the motorway would be diverted around the shrub, but also that ‘access is not permitted within a minimum 5m radius and a protective fence has been erected around it’. This one man’s crusade for the preservation of a part of Ireland’s mythical history shows us how respected these myths and legends are in the present day Irish culture. Myths such as the faeries of Connaught and Munster have survived the test of time because Ireland was seen as too distant a territory to conquer for the Roman Empire. This allowed the Celts of Ireland to develop a Gaelic society embroiled in mythology and legends. Even with the introduction of Christianity the myths and legends remained in the culture and the heritage of Ireland. The Cycle of the Kings, also known as the Historical Cycle, is one of the four main cycles in Irish folklore. It is particularly interesting because it combines almost entirely mythological characters with entirely historical figures, such as Medieval Kings, to provide poems and pieces of literature that are a mixture of myth and truth. While the myths that were created may seem unimportant to the study of history, it is essential to remember that they provide an insight into the mentalities of the people at the time. ‘Stories collected from the Irish peasantry provide insight into the Irish people.’ The tales of the Medieval Kings however, were recorded by Irish Bards, it was their duty to record traditions and genealogy of the King that they served. These records, unlike the myths have historical accuracy, certainly with bias as the Irish Bards were encouraged to show the Kings in a positive light, nevertheless, the information gathered from these records are legitimate sources for the study of history. Fairies are a fundamental aspect of Irish folklore and are an important part in Irish history and memory. Whilst today they may be viewed as fictional creatures commonly used in children’s stories, they are central to Irish mythology and hold an element of reality which should not be understated in the study of history. Irish literatures on fairies ‘have caught the very voice of the people…each giving what was most noticed in his day’. They provide a significant insight into what Irish people genuinely believed in and may still to this day; these ‘records treasured by the memory of the people were part of “real life”’ and should therefore not be discarded as simply fiction and irrelevant to the study of history. The belief in fairies and the Fairy Faith ‘is as orthodox as the Church itself’ and this link to religion has been consistent with Christian authors even viewing them as servants of the Devil, that fairies were actually demons. The fact that the belief in fairies is as legitimate to some as a religion, further suggests that it should not be disregarded in the study of history but should be used in the same way as the study of religion itself. Deirdre Sheridan Englehart, “A Story to Tell: The Culture of Storytelling and Folklore in Ireland,” Childhood Education 87, 6 (2011): 409-414. Ireland has one of Europe’s earliest surviving mythologies. As well as preserving Celtic history from at least as far back as 1000 B.C.E, the myths provided a crucial cultural link for the whole of the ancient Celtic world. It is therefore not surprising that Irish mythology shares the same Mediterranean influences as the Greco-Roman tradition, as evidenced by the similarities between the story of Deirdre and that of Helen of Troy. With the emergence of Christianity in Ireland, the old Celtic stories were written down and assimilated by the Church. New legends were created especially around Saint Patrick, one of the first missionaries who brought the faith to the island. In the Middle Ages, Celtic warrior heroes such as Cuchulain and the Fenian provided role models for military elites. England throughout the seventeenth and eighteenth centuries tried to suppress Irish cultural identity and replace it with its own Anglicised version. However, the four main cycles of myths; the Mythological Cycle, the Ulster Cycle, the Fenian Cycle and the Historical Cycle survived as oral-tradition for the common people.After the French Revolution, the combination of emerging Irish nationalism and Irish emigration to America, meant myths were adapted to create popular symbols of identity. The Leprechaun evolved as a mutated version of the legendary figure Lugh; a powerful Sun God. It was only with the Irish Literary Revival at the turn of the twentieth century that the literary merit of Irish mythology was truly taken seriously. Once Irish independence was achieved, Celtic myths continued to be popular through the inspiration they provided to various fantasy novels such as Conan the Barbarian. In fact, Irish mythology is still alive and well today. · Ellis, Peter B. A dictionary of Irish Mythology. London: Constable, 1987. · McMahon, Sean and Jo O’Donoghue. Brewer’s dictionary of Irish phrase and fable. London: Weidenfeld and Nicolson, 2004. · Neeson, Eoin. The First Book of Irish Myths and Legends. Cork: Mercier Press, 1960. · Neeson, Eoin. The Second Book of Irish Myths and Legends. Cork: Mercier Press, 1966. Peter B. Ellis, A dictionary of Irish Mythology (London: Constable, 1987), 5. Peter B. Ellis, A dictionary of Irish Mythology (London: Constable, 1987), 6. Eoin Neeson, The First Book of Irish Myths and Legends (Cork: Mercier Press, 1960), 9. Peter B. Ellis, A dictionary of Irish Mythology (London: Constable, 1987), 7. Sean McMahon and Jo O’Donoghue, Brewer’s dictionary of Irish phrase and fable (London: Weidenfeld and Nicolson, 2004), 654. Eoin Neeson, The Second Book of Irish Myths and Legends (Cork: Mercier Press, 1966), 11-12. Peter B. Ellis, A dictionary of Irish Mythology (London: Constable, 1987), 11. Peter B. Ellis, A dictionary of Irish Mythology (London: Constable, 1987), 12. Sean McMahon and Jo O’Donoghue, Brewer’s dictionary of Irish phrase and fable (London: Weidenfeld and Nicolson, 2004), 723. Peter B. Ellis, A dictionary of Irish Mythology (London: Constable, 1987), 154. Sean McMahon and Jo O’Donoghue, Brewer’s dictionary of Irish phrase and fable (London: Weidenfeld and Nicolson, 2004), 821. Peter B. Ellis, A dictionary of Irish Mythology (London: Constable, 1987), 14. There are many problems that the historian faces when looking into the mythology of a nation. It is difficult to judge where the myth originates from, as they were created so long ago there is little evidence pointing to their formation. Other problems occur, such as the job of establishing myth from fact. The two are so intertwined it makes it incredibly difficult to distinguish between historical facts and mythology, an example being the Cycle of the Kings. When half of the information told is imagined and half actually happened, the task of separating the two is challenging. Perhaps comparing that of Irish mythology to other national mythologies, such as Greek or Celtic Mythology in Scotland may lead to clearer explanations. Leprechauns are a prominent image of Ireland as a nation, and it is interesting to look back and explore where this originated. The leprechaun became a symbol of Irish Nationalistic movements and almost became an identity which would be key to a Historian studying Irish Nationalism, considering why and what made this link occur. Finally, even though it is clear that a great deal of Irish Folklore is in fact mythology with little to no historical accuracy, such as the stories of fairies and leprechauns, they are nonetheless crucial to the study of History. The importance lies in the legacy they leave behind, showing the mentalities of the people that truly believed in these myths. The analysis of why these myths were believed, when some of them are clearly quite unbelievable is essential to understanding our ancestors. Just like we would not disregard a religious view to be of significance to our study of the past, we must also remember that myths give us an insight into the lives and mentalities of those who lived in the past and bring us closer to understanding them and their actions. History is written by the victors. How individuals write history, however, is varied. Some figures feel they need legitimacy, and so aspire to create a cult of personality, such as in the cases of Joseph Stalin and Adolf Hitler. Others have history written about themselves, and become myths in the eyes of others. Churchill is a prime example of this, seen by the British people as a figurehead against Nazism in the twentieth century. Existing myths are also incorporated into stories of figureheads, such as in North Korea’s propaganda. The isolationist state idolises their dictator with statues and days of celebration. Finally, there are problems that historians could face when analysing these individuals or periods where these myths become prominent and may impact the history written about a period. The following examples are those of how myths are used by individuals to achieve different goals. ‘History will be kind to me… for I intend to write it myself’. This is a quote from Winston Churchill, the British Prime Minister during WW2, explicitly stating that he would be the architect of his own legacy. The fact that he was named the greatest Briton of all time in 2002 would suggest that he was successful in creating a legacy for himself that others viewed and continue to view positively; however, there are other factors present in constructing his legacy, such as that of a hero against tyranny. These other factors will be explored in this text, alongside how his memory has been used. Post WW2, Churchill wrote a book series named The Second World War(1959) , which covers the period from the end of WW1 to July 1945. Much controversy has circled this book series in regard to the fairness in the treatment of the material, and Churchill’s unrivalled access to such material. Firstly, in regard to bias, it has been argued, by individuals such as Callahan that the purpose of the books was to ‘carefully reconstruct the story’ in order to meet Churchill’s post-war political goals of enhancing his reputation. Therefore, Churchill’s ‘reconstruction’ of the past is an example of Churchill writing history for himself and it could be that the cult of personality surrounding Churchill was built by him. In addition to this, Churchill had access to state records that other historians could not see. Thus, a situation arose where the leader of the opposition had unrivalled access to material which allowed him to write history with the opportunity to cover himself in glory. From this, it can be concluded that Churchill certainly played a role in creating his memory. Alternatively, it could be argued that Churchill has been idolised so much due to the role he played in history, as opposed to him constructing his memory single-handedly. Marsden argues that war measures whether a politician is a good leader or not. He argues that Churchill was a disaster both before and after WW2, due to Gallipoli, his disastrous term as Chancellor, and the military interventions post-WW2, but success in war guaranteed him a favourable place in history. This view argues that Churchill’s own part in writing history is not the only reason he is remembered favourably. In my view, memory is an extremely complex thing and I do believe that the situation played the biggest part in constructing the common view of Churchill, but I do believe that he played a part in cementing it. This is why historians must handle his works and his memory with care, as he has played a role in its construction. The memory of Churchill has been invoked in recent times by President George W. Bush with regards to the war on terror. From this, it can be seen how history has judged Churchill and why current politicians want to compare themselves to him. Bush invoking Churchill against a war against evil shows how Churchill is judged. He is judged as a man with great foresight of the Nazi threat, as a man of strength, a man who leads a struggle, fighting tyranny, but most of all, a victor, against the odds. In the case of Bush, he wanted to symbolise himself as a Churchill, fighting tyranny in the form of Islamic extremism. The positivity and heroism which surrounds the memory of Churchill is like no other. Due to this, his memory is used by those who want to emulate the man himself. A cult of personality is formed to unite a nation that was deeply divided by following a strong individual. The cult of personality surrounding Stalin built upon traditional Russian values as the Russian people had always been loyal to one person, the Tsar. Stalin’s cult of personality began in 1929 when the media began to describe him as a hero. Popular support for Stalin was very much created by the government rather than real and active support from the people. Propaganda and the media were major factors in gathering support for Stalin and his regime due to the number of people within the Soviet Union who could not read or write. Therefore, oil paintings and photographs of Stalin played a vital role in creating the cult. Prior to Stalin’s cult of personality, the Soviet Union had created a cult of personality for Lenin, who as soon as he was buried, was hailed as ‘the hero of the revolution’. To gain public support, it was important for Stalin to emphasize his ties to Lenin in order to convince everyone he was his natural predecessor and he was often described as the ‘Lenin of today’. Elements of Stalin’s cult of personality had already been established during the struggle for power when Stalin described all of his opponents as anti-Leninists and described himself as a disciple of Lenin. The newspaper Pravada described Stalin as ‘Lenin’s most faithful and dedicated pupil and associate’. The government had control over all media and the main newspapers had a very narrow range of views and propaganda was a major factor in creating support for Stalin and his regime. The propaganda which was produced was used to show Stalin as a great leader and a man of the people and that he was there to save and protect Russia. The fact that the media was controlled by the government meant the population were given a very limited amount of information which restricted the element of any kind of public debate or opposition to the regime. After the Second World War, Stalin moved quickly to portray himself as the one who had saved the motherland and in June 1945 promoted himself to ‘Generalissmo’. Stalin was often referred to as the sun. The Earth revolves around the sun and therefore the Soviet Union revolved around Stalin, this reference was mainly portrayed in literature. In visual propaganda, Stalin was also in the centre, or at least the main focus and as time went on Stalin was increasinly pictured alone rather than as part of a group so he would be the sole focus. There also various examples of images that had been altered either to show that he was always loyal to Lenin or to remove people who he saw as his enemies. 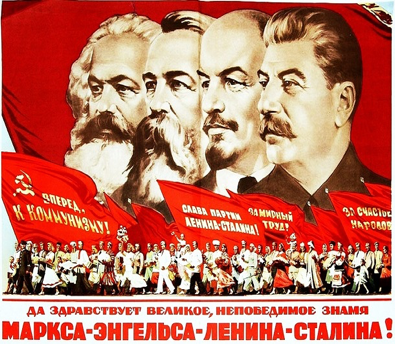 The image of Stalin and Lenin was from the VIII Congress of the RKP and was cropped in order to emphasise the relationship between Lenin and Stalin. After 1926, there was an ever-increasing propagation of the cult of the all-knowing Il Duce (leader). Those surrounding him realised that without him they were nothing: the greater he was, the greater they would be. But the most enthusiastic supporter of Mussolini’s invincibility was his brother, Arnoldo, who, day after day in the newspaper Il Popolo d’ltalia, described the Duce as the greatest statesman in Europe who had placed his wisdom, heroism and intellect at the service of his people. The press was enlisted in depicting the Duce in a diverse range of activities: fencing, riding, driving and even playing the violin. He was compared to great thinkers like Aristotle, Kant and St Thomas Aquinas. He was described as the greatest genius in Italian history, greater even than Dante or Michelangelo. Mussolini’s picture was displayed often in heroic pose on all public buildings, and many people had his photograph printed on the head of their writing paper. The youth of Italy were key targets in Mussolini’s indoctrination process. It was compulsory to join a Fascist youth organisation.At the age of four, boys became Sons of the She-Wolf. From this, they would progress to the Balilla at eleven and eventually the Avantguardisti at 14. Pre-military training accompanied the Fascist indoctrination process. In schools, Fascist text-books became the norm. By the time they left primary school, they had learned how Fascism saved Italy from Communism. Teachers were ordered to magnify Mussolini, to stress his courage and brilliant mind, and to teach that to obey him was the highest virtue. Teachers who were anti-Fascist lost their jobs and university professors had to take an oath of loyalty to ‘the Fascist Regime.’ Therefore this has a significant impact for historians who approach the period due to the manipulation of resources during the time making it harder to access the reliability of the Fascist regime. Mussolini’s cult of personality, had created a significant unrealistic image of himself, similar to that of Adolf Hitler, this use of propaganda allowed Mussolini to stay in control for many years and was played on in order to remain Fascist leader of Italy. There are two sections to Hitler’s mythology – the mythological portrayal of Hitler himself, and Hitler’s promotion of myths to the masses. In terms of the mythological portrayal of Hitler as a leader, his image as a saviour of Germany during the turbulent economic times resonated through the early Nazi party. The ‘Hitler myth’ as it is known was borne out of Joseph Goebbels, Hitler’s Minister for Propaganda, who described it as his greatest propaganda achievement. Posters, films, radio, literature and sculptures were devoted to promoting the idea of Hitler being the ultimate leader of Germany to the German people. Speeches by Hitler also utilised emotive language about his humble beginnings to connect him to the general populous (see YouTube video) so that they would be more entranced by his image. Of course, Hitler ultimately did not prevail as the chosen leader of Germany – the ‘Hitler myth’ did not last past the end of the Second World War – however, it was important in his climb to power and his maintenance of said power. Without posters such as the one shown, the deity-like imagery of Hitler would not have been so widespread, which ultimately encapsulated in the people believing in him as the person to lead Germany into prosperity. In terms of Hitler’s promotion of myths, an obvious starting point would be his book, Mein Kampf (My Struggle), published in 1925 and 1926 in two volumes. In this, he details the basis of his Nazism, such as the need to remove Jews from Germany and Europe, expand German living space, and his distaste for other political views such as socialism. The Jewish people, among others, are referred to as ‘international poisoners’ to be exterminated, and promotes the idea of ‘the Jewish peril’ – the conspiracy that the Jews are trying to gain world leadership. Throughout his reign, this idea of the Jews being a force for evil is perpetuated by various propaganda, such as the film The Eternal Jew, and numerous posters such as the one shown, which accentuates the stereotypes of Jews, such as big noses. Of course, the myth of the Jews’ evil is used by Hitler as the creation of a scapegoat in order to increase support for the Nazis, but the horrors of the concentration camps shows that Hitler’s portrayal of myths was one that had extremely violent connotations. There are multiple different ways that individuals have portrayed themselves (and have been portrayed) in history. The reasons for doing this have been varied, such as using Churchill as a figurehead in the fight against Nazism, or gaining legitimacy through propaganda and cults of personality often seen in authoritarian states such as those of Stalin and Mussolini. These myths determine not only how the remaining population see the person in question, but also how they are seen throughout the rest of history. When creating myths of people for immediate use, history has shown us that it is far easier to be done and is far more effective in an isolationist dictatorship such as North Korea is today. Media is tightly controlled by the government, and used as propaganda against the people. The individual in history can prove to cause some problems for a historian when they look at the period or person in question. For example, propaganda is often very biased towards a positive presentation of the government, and would not show what the average person was thinking, especially if the media comes from an oppressive regime. Winston Churchill was idolised by the British people and the rest of the world perhaps due to his position as a leader of the ‘free world’ during his time, and the British population certainly needed someone to rally behind. A historian, therefore, needs to examine each case individually, taking into account many factors such as the political climate, the opinion of the working and ruling class and anything else that could factor into a myth of an individual. It could be these underlying issues that caused the individual to rise to their position in the first place. Historians need a broad understanding of the state’s history as well – there may have been problems or reasons that became topical a long time before that individual was prominent. For example, before and during the First World War, Germany was a proud militaristic state, who lost a large part of their armed forces following the Treaty of Versailles. Some of the more radical members of the population blamed the newly formed Weimar Government for this betrayal (also known as the “stab in the back doctrine”). Hitler could use this hatred of the current democratic government, as well as situations such as the economic crisis in the late 1920s, to gain popularity by promising to make Germany great again, allowing him to take control as a powerful dictator. "BBC NEWS | Entertainment | Churchill Voted Greatest Briton". N.p., Thursday, 22 August, 2002, 12:45 GMT 13:45 UK 2002. Web. http://news.bbc.co.uk/1/hi/entertainment/tv_and_radio/2208532.stm. Accessed - 22 Feb. 2016. Bosworth, R. J. B, Mussolini (Arnold 2002). Churchill, Winston. Memoirs Of The Second World War. Boston: Houghton Mifflin, 1959. Print. Koon, T, Believe, Obey, Fight (University of North Carolina Press 1985). Martin, John M. "Winston Churchill's Cold War (January 2003) - Library Of Congress Information Bulletin". https://www.loc.gov/loc/lcib/0301/churchill.html N.p., 2003. Web. 22 Feb. 2016. Smith, D, Mussolini (Knopf 1982). Smith, D, Lyttleton, A, Mussolini's Rise To Power (Audio Learning Ltd 1971). 'Benito Mussolini - Wikiquote' (It.wikiquote.org, 2016) <https://it.wikiquote.org/wiki/Benito_Mussolini> accessed 18 April 2016.
. Phillips, Steve, Stalinist Russia, London: Heniemann, 2000, p. 122. Tracy H Koon, Believe, Obey, Fight (University of North Carolina Press 1985).